My walk up Scafell Pike. My walk to the top of Scafell Pike From Wasdale Head. Last year I walked up Ben Nevis (link to my blog about that here), a few years previously I walked up Snowden so I have always had the intention of completing the trilogy of tallest peaks in Great Britain. My own personal three peaks challenge, just not completed in 24 hours, more like 6 years. 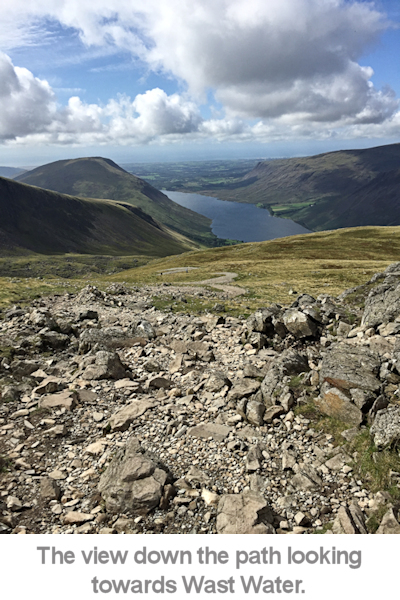 This is my account of the walk to the top of 978m-high Scafell Pike. 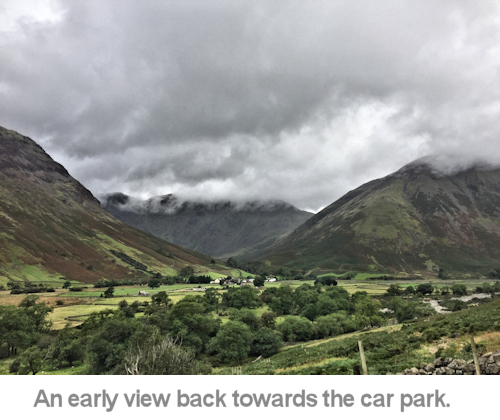 I’ve done a bit of reading about the walk starting from Wasdale Head and none of the articles mentioned the road to get there. It’s a narrow single track with passing bays so some patience is required to make it to the end. Even more interesting are the sheep that rest in the middle of the road, cattle grids and blind-crest hump-back bridges. It’s a shame the views are stunning as this road runs alongside Wast Water, the lake at the end of which is Wasdale Head. As a driver, I couldn’t take my eyes away from the road for a second but your passengers will have a lovely time on the way in. In my opinion anyone driving a camper van or similar sized vehicle would struggle to get past other vehicles, it’s that narrow. That there is even a road to the foot of the walk is remarkable in itself and I was very pleased to use it, just approach with caution. Once you reach the car park, which was, amazingly, free of charges to use (August 2017 – who knows if that will change in the future), there are toilets and that’s about it. Just across the road is an inn and a small campsite. The walk from Wasdale Head is popular as it’s seen as the easiest of the different routes to the top so the car park gets busy. I arrived around 8:45am and had no problem parking but it was a Wednesday. I imagine had that been a weekend or bank holiday then things might have been very different. There is an overflow car park sign so maybe that’s taken care of. It wasn’t needed on my visit there at least. On my return to the car park at the end of the walk, it was full. The walk starts by heading back down the car park to a gate and a short walk across a field to the bridge over Lingmell Gill. Immediately after crossing the bridge the ascent begins and passes through a few small but gnarley trees. Gently at first, but the surface gives you an early warning of things to come, a never-ending uneven trail of randomly sized stones and at times with water running down it too. Lets not forget though this is a wild place so it’s reasonable to expect difficult walking conditions. It was obvious for most of the walk just where the route was, this is a heavily used path so on my day at least, there was no doubt as to the direction. Even starting at 9:00am, I was one of many who set out to reach the top and I only had to look in front of me and observe my fellow walkers to know the direction I was heading. That said, I had a map of the route and a compass just in case. The weather is changeable in the Lake District and low cloud can quickly move in, obscuring the view so never assume you can navigate by vision alone. Prior to my visit I’d studied the route so I knew what to expect. I also took along a torch, whistle and an emergency heavy-duty polythene survival bag. Be prepared for the worst. I chose this day in particular because the weather forecast showed no rain but the good ol’ British weather obviously didn’t read the script and it rained. Experienced walkers will know to be prepared for mixed conditions in the UK and I was no exception. I had a waterproof jacket and trousers which sadly I had to make use of. This walk is a big draw for many non-walkers and I saw a lot of people who were attempting this in gear more suitable for playing football. They probably started in the sunshine but if that weather changed they could at best have had a very wet and miserable walk back to the car. I don’t want to imagine what else could have happened to them. As the walk makes its way up, the views quickly become ever more spectacular and as the climb gets steeper, each stop to catch breath can at least be an opportunity to check out the glorious scenery. Unless you have the lung capacity of an olympian, most people doing this walk will have plenty of these scenery-observing moments. 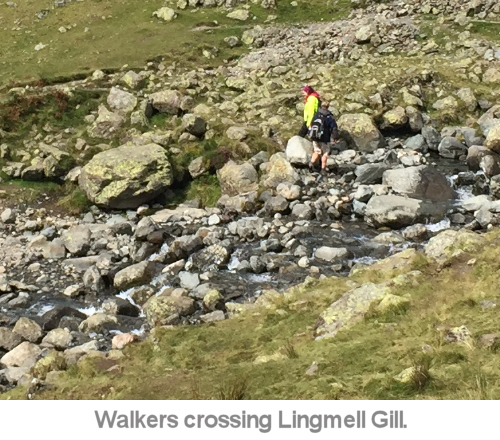 Fairly quickly, walkers have to cross Lingmell Gill, a stream that runs down under the bridge I crossed to start the walk. There are many stones over this on which to cross but none are there ‘on purpose’ so I had to find a route over the randomly-placed large and small boulders that meant I didn’t get wet feet. I chose a way over just a few metres up the stream. I imagine though this could be made ever more tricky by heavy rain adding to the volume of the stream. Choose a route over here with caution, the rocks can be slippy. Climbing further up the steep path I encountered a team making repairs. 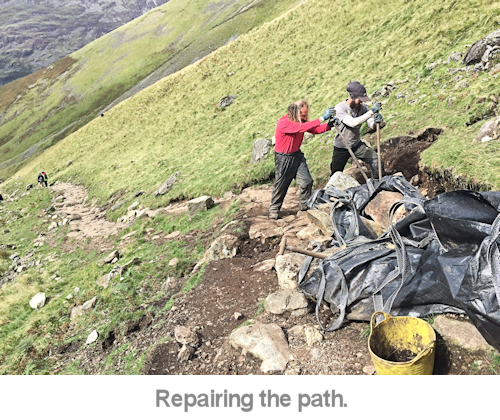 Bags of rocks are brought in by helicopter and used by these teams to improve the path. I was impressed that they have to walk to this spot and then do heavy manual labour. After chatting to them for a short while it was interesting that amongst the repairs they make it’s not all about huge rocks. They had laid grass seed to grow across part of the walk that went off at a tangent, away from what would be the preferred route. This new grass hid this route and kept walkers on the right one. I stopped for a bite to eat at what I can only describe as a little boulder field. Piles of very large and smaller rocks. A great place to see the views of Wast Water below or indeed to look at the towering crags and rock faces around me. The views constantly changed during the early part of the walk as the cloud rolled in, one minute I could see the Irish sea, the next, only cloud. Luckily the weather lifted and for the remainder of the day I had beautiful blue sky and fluffy clouds. Just great for the photographs. A little further up the route from the boulder field the path has it’s easiest walking spell, where it’s still steep but easy under foot. Not for long though as the random rocks and boulders take over again. At this point I came across an interesting feature, slabs of rock with what look like man-made marking, as if they've been cut by a machine. I don’t know if these were man-made or natural but they stood out against all of the other very natural rock I had encountered during the day. Continuing on up, the path flattens slightly then when as the last few metres are reached it steepens again to reach the top. It took me 3 hours to reach the summit. 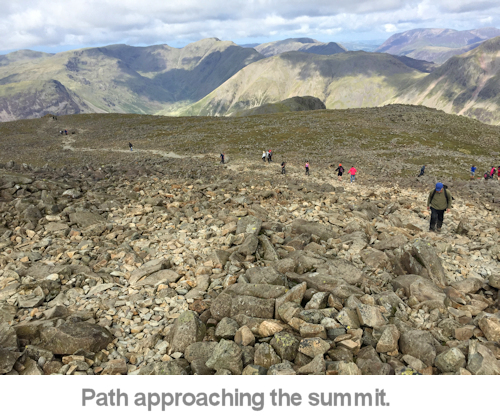 The top surface of Scafell Pike is dominated by many more small rocks, some of which are loose making it tricky underfoot to get around. It would be very easy to twist an ankle. This area is about the size of a small football pitch and features a large cairn with steps up to the top where most walkers grab some pictures and take in the stunning views of the Lake District and the Irish Sea. On a good day it’s possible to see The Isle of Man. On a good day. As you might expect on top of such an important peak, there’s also a trig point. I stopped to get as many pictures as possible and eat some food. As I sat there a jet passed by between the peaks below me. That was very impressive. After taking it all in I made my descent back down the path from which I came. Although my 2 hour descent was faster, it was harder on my legs. I actually prefer the walk up which is tiring but somehow easier. This was a walk I’ll remember for a long time and I’d certainly recommend it to anyone who likes a challenge. It’s a hard day’s hiking but the satisfaction of reaching the top of England’s highest peak and those stunning views make the effort well worthwhile. As with all walking, be prepared for bad weather, or good (take a hat and sunblock!) take plenty of food and water, map and compass. Be safe and enjoy a fantastic day out. All images © Peter Hatter. Article Date - August 2017. © 2017 Peter Hatter Photography Ltd. All rights reserved.